Secretary of Defense Jim Mattis urged the Army Monday to be prepared in case diplomatic relations with North Korea break down. President Trump seemed to signal in recent weeks that he’s grown tired of diplomatic efforts to rein in the rogue regime. “Presidents and their administrations have been talking to North Korea for 25 years, agreements made and massive amounts of money paid hasn’t worked, agreements violated before the ink was dry, makings fools of U.S. negotiators. Sorry, but only one thing will work!” he tweeted earlier this month. Mattis urged the audience to be ready if Trump needed them. 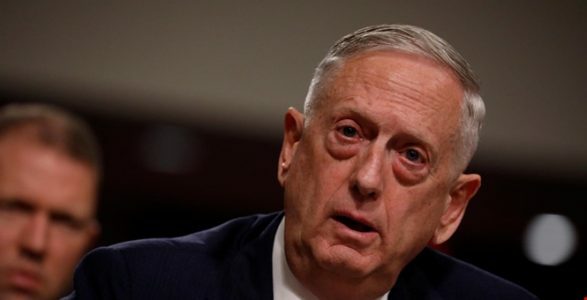 And the world, Mattis said, would much rather deal with the Department of State than the Department of Defense. “What we want to do is be so ready and be very much aware that we fight the way we come, that everybody in the world wants to deal with Secretary Tillerson and the Department of State, not the Department of Defense and the United States Army,” Mattis told the audience.